It never ceases to amaze me how often we choose to read a book that ends up answering a different need than we thought we had for picking it. Perhaps it is simply because each book that we enjoy enough to keep reading is rich in ideas. Four weeks ago I borrowed 11 books from the Vancouver Public Library's downtown location. One of them is Kathrine Switzer's Marathon Woman. It's one of those books that I thought I should have read a long time ago but simply haven't. 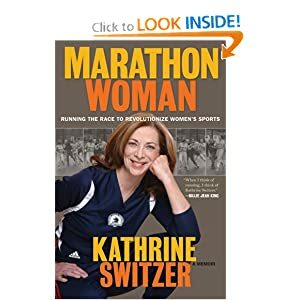 Switzer is of course most famous for being the first woman to run the Boston Marathon with an official entry in 1967, though organizers weren't too pleased when they realized K.V. Switzer, racing with number 261, was female. The images of Jock Semple trying to grab her race number before being pushed out of the way and onto the ground by Switzer's then boyfriend Tom, a 235-pound hammer thrower who had decided at the last minute that he was fit enough to run a marathon without training, are among the most famous marathon images. 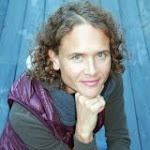 I begun reading the book because I wanted to know more about the history of women in marathon running. And I found plenty about that in Switzer's book. But to my surprise I also found new motivation for my sub-3 marathon quest, which has stalled in the past two years as my 3:07:10 marathon PB was set in the 2008 Victoria Marathon. (Since then I've run two 3:10s and a 3:11). Switzer's first marathon in 1967 took her about 4:20. By 1974 she improved from a 3:16 marathon, to a 3:10 and then a 3:01. In 1975 Switzer set a 2:51 PB in Boston. Talk about inspiring! "Every morning, Monday through Saturday, Switzer ran 6 miles at 7:45 pace per mile. Every evening she did another 4 miles, plus occasional speedwork, finishing with a 3-mile cooldown. Her speedwork consisted of either 880s in 2:45-2:50, 440s in 82 seconds, 220s in 37.5 seconds, or repeat 2 milers in 12:20. On Sundays, Switzer ran 20 miles with negative splits, starting at 8-minute pace and working down to 7:15." Today I became a member of BC Athletics and signed up for the 2011 Vancouver Marathon on May 1. This will be my third Vancouver Marathon, and 14th marathon, after a 3:12 in '08 and a 3:10 in '09. For the 2011 edition, which is the event's 40th year, I am planning on a PB, so sub 3:07. Time to decide on a training program.